Mom! I go potty, wash my hands, and get a treat! 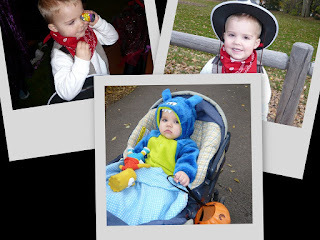 Yesterday the kids donned their Halloween costumes and braved "Boo at the Zoo" at the Tautphaus Park Zoo in Idaho Falls. Elena (my sister-in-law), her kids, and my Mom joined us! 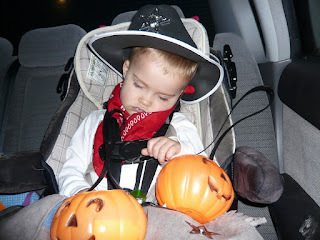 Owen quite enjoyed wearing his costume for an additional day...especially since he has been talking about being a cowboy for the last couple months. In fact, he has had Cowboy on the brain and has temporarily (we hope)forgotten all the answers to the questions that are supposed to make his parents look good (What's your name? Cowboy; How old are you? Cowboy; When is your birthday? Cowboy). Wesley was a good sport and even kept a pretty tight hold of his pumpkin bucket...until Owen decided he needed to carry and fill both buckets...for himself. 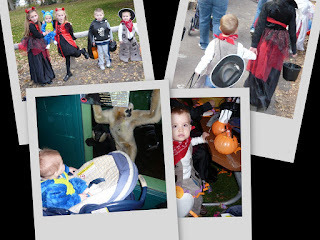 Owen loved being able to see the animals, looking at all the costumes, and trick or treating (he stopped at each booth at least twice). And while we were visiting the monkey exhibit we discovered a little Tamarin monkey having a baby. How crazy is that? The zoo keepers had no clue it was even going on. It was VERY interesting to watch this little mommy do her magic (pushing the baby out and cleaning/eating up the mess). I can't believe we didn't take any pictures, but we were in such awe that we just didn't even think about it. After we had seen enough Elena went and got a zoo keeper and they closed the exhibit. It turned out to be a very eventful and enjoyable evening. So glad we went! 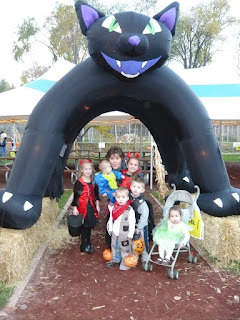 Grandma and her grandkids-I love how you can tell they are all saying "BOO!" 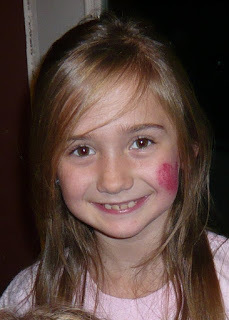 Happy Birthday Alyssa! I took this cute picture of you on my birthday earlier this week. You are certainly growing up to be a smart and adorable girl. We hope you have a spectacular birthday today! Yesterday I celebrated my 29th birthday! 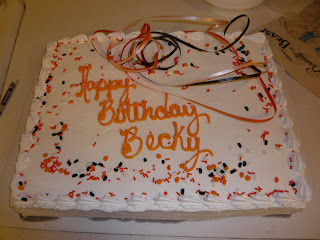 Actually, I kind of celebrated all weekend long (which is allowed when your birthday is on a Monday). I love birthdays! I love the cake, the icecream, the presents, the excuse to eat all day and not feel bad, and the fact that you aren't expected to lift a finger. What is not to love about that? Sunday my mom invited us over for dinner as part of my birthday present (she knows that I hate making dinner on Sundays). So we drove to Idaho Falls on Sunday and just stayed the night. Monday morning Kevin made me a spectacular birthday breakfast (pancakes, eggs, and bacon) and then we went birthday shopping and out to lunch. 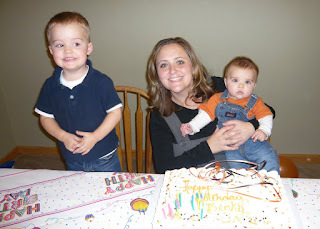 We topped the night off with a birthday bash at my mom and dad's with most of my family (missed you Katie and Melissa)! The day could not have been better! Thanks to everyone for making twenty-nine feel so good! Last week we made a visit to my Grandpa Freidenberger's (my mom's dad) home in Idaho Falls. We don't stop by there too often because they live "out in the country" and it's not too easy to drop-in. But, Kevin needed to interview certain age groups for his Geriatrics class and my Grandpa and his wife Shirley were two eligible candidates. When we arrived Shirley presented Owen and Wesley with little toys. 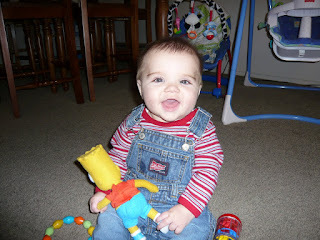 Owen received a cute little dump truck and they gave Wesley a little Bart Simpson "doll". I guess I had never thought of getting a little baby a Bart Simpson "doll" before since I am not much of a Bart Simpson fan and can't even claim that I have watched an entire episode of The Simpson's. But, we accepted the gift with gratitude and couldn't believe how thoughtful they were. Well, over the last week Wesley has grown quite fond of this little "doll". It's so funny! Little Bart is just the perfect size for Wesley to get a good grip of and wave around. And, Wes loves to hold Little Bart's hands and chew on Little Bart's cute tennis shoes. When people come over and see Wesley' playing with a Bart Simpson "doll" they just laugh. It's too adorable! So, there you have it. Owen was attached to his blanky, Wesley will be attached to his Bart doll. I have been dreading this day for two years, but I feel like it's time to start. So, today when Owen woke up he put on his "Cars" underwear and we were off! ROUND ONE: I was really discouraged when I sat Owen on the toilet and he just broke out into tears and wouldn't let go of me. No potty! ROUND TWO: Still no potty! 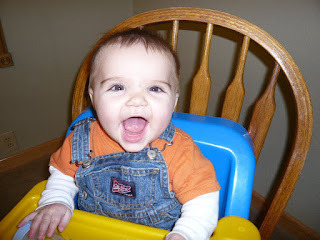 But, he has learned to hold himself up with his hands and gets excited about washing his hands. He jumps off the toilet and dashes out of the bathroom to Wesley to tell him all about it. ROUND THREE: Now in his "Diego" underwear, he is getting a little more confident about not falling into the toilet and allows me to stand back and watch. Next thing I knew, Owen was looking into the toilet with a look of amazment and believe it or not...he was peeing! Hooray! He was so pleased with himself he jumped right off and gave me a kiss. He almost looked stunned at how easy the whole thing was. 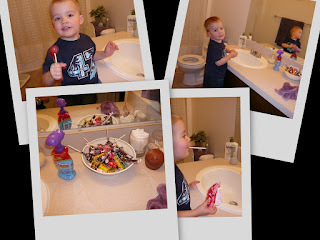 So, he washed and hands and grabbed his "potty treat"! "Mom! I go potty, wash my hands, and get a treat! Thanks Mom!" Five minutes later Owen runs into my room yelling "Mom, I am all wet!". Oh, boy! So here we sit, Owen now in his "Thomas The Tank Engine" underwear, and I am dreading nap time and his first bowel movement. Wish me luck! As Wes gains more control of his "limbs" he becomes more entertaining to watch. We had to capture his latest display of control because it's too darn cute. When he is content he loves to kick his chunky little legs. It makes us smile every time he does it. P.S. He was being supervised as he played with these "just right for swallowing and choking on" game pieces. Yes, the copy cat is back...and we love it! 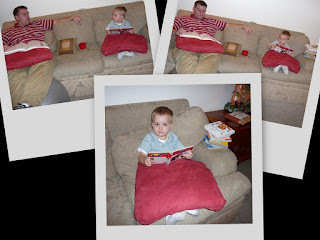 Last night Kevin sat down to study and Owen was right behind him with his piles of books complete with a pillow on his lap. He really admires his dad! 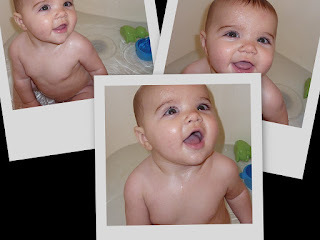 Wesley loves bath time now that he can sit up and enjoy bath toys and look around. 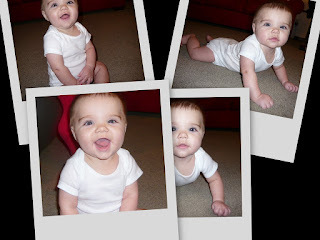 He is so much fun (except for in the middle of the night)! We all adore him...especially Owen. In the last week Owen has really enjoyed entertaining Wesley. It's fun to see them interact together. My boys!